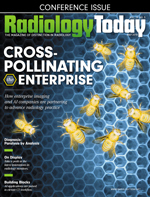 Editor's Note: This article is based on press materials provided by the Society of Interventional Radiology (SIR) in March at its Annual Scientific Meeting in Los Angeles. Advanced-stage liver tumors may be safely treated through image-guided injections of an immunotherapy approved for melanoma, according to a study presented at SIR's Annual Scientific Meeting. Phase 1 data indicate that talimogene laherparepvec (T-VEC)—a genetically modified version of the herpes virus—can be safely administered into active cancer in the liver and stimulate the immune system to destroy cancer cells throughout the body. "Advanced-stage liver tumors, including ones that have spread from other locations, have limited treatment options because the patients can be in poor health; further, the complex structure of the organ can make it difficult to target with standard approaches," according to Steven S. Raman, MD, a professor of radiology, surgery, and urology at the David Geffen School of Medicine at UCLA and lead author of the study. "This minimally invasive treatment offers patients a novel way to directly and indirectly attack the cancer cells." Using image-guided needle injections, researchers at centers in the United States, Switzerland, and Spain treated 14 advanced-stage cancer patients who had liver metastases, including those with cirrhosis. Patients were given escalating doses of T-VEC, up to the maximum FDA-approved dose for melanoma. Injection volume was based on lesion size. Researchers found the patients tolerated the treatment well with expected side effects, including temporary flulike symptoms. As part of the study, researchers will follow patients for up to two years, and new trials to investigate the effectiveness of the drug in treating advanced cancer in the liver are being planned. Additional investigation is also planned to test the therapy in combination with a checkpoint inhibitor to activate a stronger immune response. "Image-guided treatments have expanded the options available for patients with liver cancer from innovative approaches to biopsies to resections to chemo," according to Raman. "This is an exciting way to look to the future, but patients living with advanced liver cancer should understand that this treatment will not be available for several years, except through clinical trials." The authors note several limitations of the current study, including the preliminary nature of the results, as well as the number of patients tested. Amgen, the pharmaceutical company that makes T-VEC, was a sponsor of the trial. Freezing the nerve that carries hunger signals to the brain may help patients with mild-to-moderate obesity lose weight, according to a study presented at SIR's Annual Scientific Meeting. The treatment was determined safe and feasible in the initial pilot phase. "We developed this treatment for patients with mild-to-moderate obesity to reduce the attrition that is common with weight-loss efforts," according to David Prologo, MD, FSIR, ABOM-D, an interventional radiologist from Emory University School of Medicine in Atlanta and lead author of the study. "We are trying to help people succeed with their own attempts to lose weight." In the study, 10 subjects with a body mass index (BMI) between 30 and 37 underwent the procedure and were followed for 90 days. All subjects reported decreased appetite, and the overall average weight loss was 3.6% of initial body weight and an average decline of nearly 14% of the excess BMI. No procedure-related complications were reported, and there were no adverse events during the follow-up. "Medical literature shows the vast majority of weight-loss programs fail, especially when people attempt to reduce their food intake," according to Prologo. "When our stomachs are empty, the body senses this and switches to food-seeking survival mode. We're not trying to eliminate this biological response, only reduce the strength of this signal to the brain to provide a new, sustainable solution to the difficult problem of treating mild obesity." Following the success of this preliminary safety and feasibility study, more patients are being recruited for a larger clinical trial of the procedure to test its efficacy and durability. The authors noted several limitations of the study, including the small sample size and the interim nature of the results. The study was funded by HealthTronics, a medical technology company that manufactures the ablation probes used for the treatment. A relatively inexpensive 3D-printed model of a patient's blood vessels is as effective as current commercially available models for training medical students in IR vascular access, according to a study presented at SIR's Annual Scientific Meeting. Many commercially available devices cost between $2,000 and $3,000 each, while 3D printing has the ability to produce practice models inexpensively and more realistically, per the authors. "We've come up with a viable method for creating something that's inexpensive and also customizable to individual patients," according to Alexander Sheu, MD, an interventional and diagnostic radiology resident at Stanford University School of Medicine in California and lead author of the study. "The current model used to train medical students lacks the ability to replicate a patient's anatomy. Our 3D-printed model will provide students a more realistic experience, allowing for better preparation before they perform procedures on real patients." Interventional radiologists commonly treat patients using less invasive options to surgery that involve inserting a catheter through a major artery under ultrasound guidance in order to reach internal organs or blood vessels. The researchers tested medical students' comfort in using a 3D-printed model, compared with commercially available models, to simulate ultrasound-guided access through the femoral artery in the groin. Thirty-two students were randomized to practice with the 3D-printed model or the commercial model in a simulation experience developed by the study's authors. Prior to the simulation exercise, 73% of the 3D group and 76% of the commercial model group indicated that they did not feel confident in performing the procedure. After the training, most of the 3D model and commercial model trainees agreed that their respective models were easy to use (93.3% and 94.1%, respectively) and helpful for practice (93.3% and 94.1%, respectively). Additionally, confidence in performing the procedure—femoral artery access—increased a similar amount in both groups. "Now that we know that a 3D-printed model is just as effective at training medical students in this type of procedure, this simulation experience can be made available to even more trainees and potentially improve procedural skills for residents, fellows, and attendees," according to Sheu. "We foresee this really making an impact in the world of interventional radiology training." The 3D-printing technology can reproduce a patient's exact vessels based on a CT scan and produce an ultrasound-compatible vascular access model that is unique to that patient's anatomy. To adapt the 3D printing technology to their needs, the researchers used a tissue-mimicking material that was durable, to withstand punctures, but still felt realistic. This tailoring allows trainees to practice with variations in anatomy before they encounter them during a procedure, which may help to lower complication rates, according to the researchers. A nonsurgical treatment could improve quality of life for patients with knee pain due to osteoarthritis, according to new research presented at SIR's Annual Scientific Meeting. In the first US clinical trial on geniculate artery embolization (GAE)—a minimally invasive, image-guided treatment that blocks key arteries in the knee to reduce inflammation and pain—a majority of study participants achieved significant pain reduction and improvements in range of motion, avoiding more invasive measures. "A majority of our patients with osteoarthritis of the knee saw significant pain reduction, not only just a few days after the procedure but a month after as well, making this an accessible treatment for patients looking to improve their quality of life without surgery," according to Sandeep Bagla, MD, director of IR at the Vascular Institute of Virginia and lead author of the study. "We are very encouraged by the results and the implications for the millions suffering from this common yet debilitating condition." Interventional radiologists perform GAE for knee pain by inserting catheters through a pinhole-sized incision, blocking the very small arteries or capillaries within the lining of the knee, reducing the inflammation caused by osteoarthritis. As an outpatient treatment, GAE does not require open surgery or physical therapy and takes 45 to 90 minutes to perform. This prospective, multicenter clinical trial evaluated 13 patients with severe osteoarthritis pain. Each patient's pain and disability were measured along two scales, with evaluations before and after the treatment. The treatment was successfully completed in all 13 patients, with no adverse events. One month later, researchers followed the progress of eight patients and found that GAE significantly decreased pain (-58 mm on the Visual Analog Scale), reduced stiffness, and increased physical function (-36.3 on the Western Ontario and McMaster University Osteoarthritis Index). Together, the scales represent an 80% improvement in function compared with preprocedure conditions. "This procedure could have a significant impact in the treatment of osteoarthritis pain as a whole," according to Bagla. "The current mainstay of treatment in patients who have arthritis are pain medications, which come with significant side effects and risks. GAE provides another option for patients struggling with pain and may even allow patients to avoid the painful recovery of knee surgery and the need for the kind of opioid pain medications associated with the dangerous epidemic in the United States." While preliminary data show that the treatment does work and is feasible, it has only been used in a clinical trial setting. The study has completed enrollment of 20 patients and final results are expected in summer 2018. Interactive virtual reality (VR) brings medical images to life on screen, showing interventional radiologists a patient's unique internal anatomy to help effectively prepare and tailor an approach to complex treatments, such as splenic artery aneurysm repair, according to new research presented at SIR's Annual Scientific Meeting. "Treating splenic artery aneurysms can be very difficult because of their intricate nature and anatomic variations from patient to patient," according to Zlatko Devcic, MD, a fellow of IR at Stanford University School of Medicine in California and collaborating author of the study. "This new platform allows you to view a patient's arterial anatomy in a 3D image, as if it is right in front of you, which may help interventional radiologists more quickly and thoroughly plan for the equipment and tools they'll need for a successful outcome." Researchers compared the new VR technology with the use of images from a commonly used visualization software system that displays images on a standard 2D platform. VR turns a patient's preprocedural CT scans into 3D images that the radiologist can virtually move and examine while wearing VR-type glasses. By allowing the operator to manipulate routine, 2D images in an open, 3D, 360-degree space, VR provides a look into patients' organs and tissues that had not been possible outside of the human body until now. As a result, the operator is armed with a deeper and intuitive understanding of spatial relationships, such as between an aneurysm and the surrounding arteries. In the study, three radiologists, using both technologies, independently evaluated 17 splenic artery aneurysms in 14 patients. Researchers measured the radiologists' accuracy in identifying inflow and outflow arteries associated with the aneurysms with each method. Radiologists in the study also ranked improvements in their confidence on a four-point scale when using VR compared with the standard method. Researchers found accuracy was similar with both methods, though confidence improved substantially with VR. Ninety-three percent of participating physicians who used the VR method indicated higher confidence in their abilities (a score of at least 3). "Preoperative planning is possibly the most important step towards successfully treating a patient so the value of VR cannot be understated," according to Devcic. "This technology gives us a totally different way to look at that structure and safely plan our approach to patient care."